I feel like I’m always promoting this “chickpea chocolate chip cookies” recipe to every person on Earth I meet who wants to eat better but has a brutal sweet tooth. I feel as though it’s my duty to help them because I too, have a major addiction to anything sweet and sugary. Sugar cravings are especially common for those of us who workout religiously because we’re always burning carbs for energy and for us meatheads, we usually keep our carb intake low in order to stay lean. And this is all fine and good. But what happens when you eat a high-protein, low-carb diet and you’re constantly burning up your glycogen stores doing exercise? Your body essentially craves the most easily accessible, quick source of glucose. You guessed it: SUGAR! So what do I do when I want to enjoy something sweet but don’t wanna commit carbicide? I bake with beans! 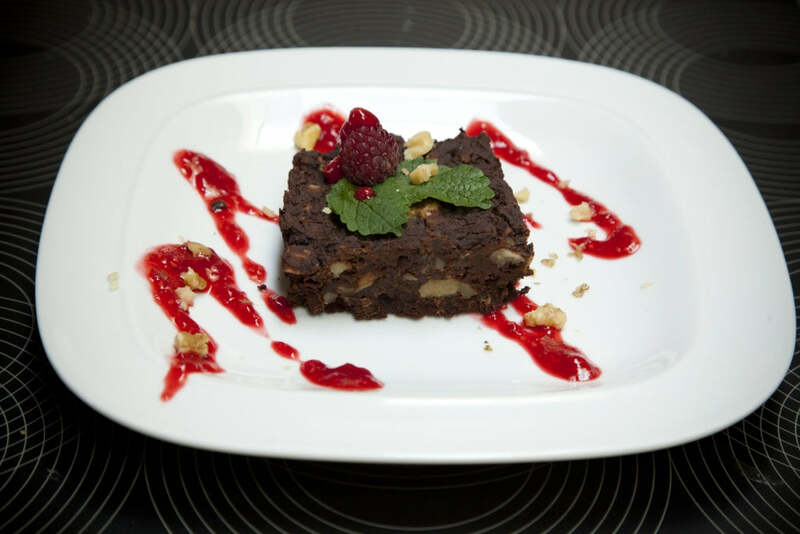 Yes, for anyone who has my eBook, I have a killer recipe for black bean brownies that are sweetened with dates. Dates are the shizzzzzz because they’re high in fiber, all-natural and an awesome, raw food source that quickly replaces lost glycogen after intense training. And those brownies are so damned moist and chocolately, people are always SHOCKED when they find out they’re made with beans. Anywho, the other day I was chatting with one of my lovely clients (Kelly) about our fave bean-filled vegan treats. 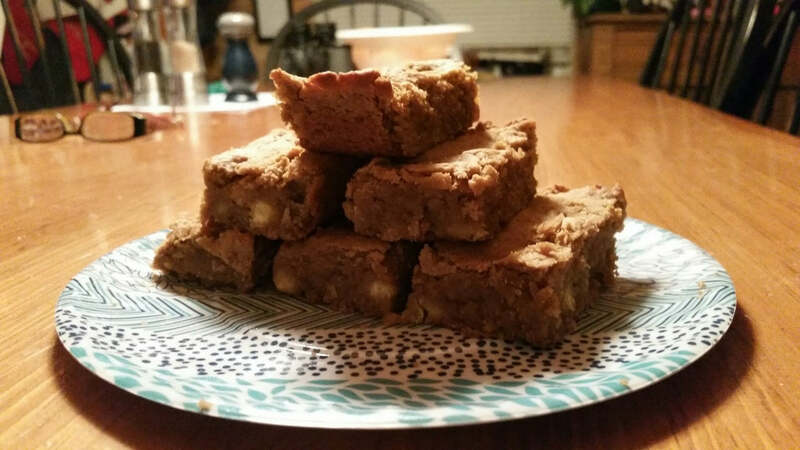 She mentioned that she regularly whips up chickpea “blondies” to satisfy her sweet cravings. Believe it or not, to this day, I never knew that “blondies” were the white cousin of “brownies.” And I probably never expressed much interest in them because I’m such a huge chocolate freak. But when Kelly said you can put chocolate chips in ’em AND satisfy the vanilla freak choco-holic inside of me, I was so ready to branch out. What I also love about this recipe is that it doesn’t make a HUGE amount. So even if you end up eating the entire (small-ish) pan in one sitting (not admitting one way or the other..) you don’t have to feel guilty! Yup, they’re low-carb, made with all-natural, plant-based ingredients, high in protein and sweetened with my beloved Ottawa Valley homegrown maple syrup. Yup, these “chickpea blondies” are a new Shorkey fave fo’ sho’!! Optional: 1/3 cup vegan chocolate chips or chopped-up dark chocolate bar, chopped nuts, dried cranberries, raisins – whatever suits your fancy! Preheat oven to 350 degrees F. Throw all ingredients (except “optional” items if using) in food processor. Blend until smooth then fold in chocolate (can leave some out for sprinkling on top) and spread into parchment-lined pan or lightly-sprayed square pan. Kelly’s warning: it can be rather sticky so sometimes she’ll lightly coat her spatula with a drop of oil to avoid sticking. Bake for 20 – 25 minutes. Once done, they may seem under-cooked but if you leave them in the oven for too long, they’ll dry out. Cool slightly. Kelly keeps hers refrigerated. I like mine warm and gooey. Maybe that’s why I ate the entire pan in one sitting. Fine, I admit it. Oh these look good! Question: can I substitute with stevia and a bit of water for the syrup? I can’t have much of any concentrated sugar… Thanks! That’s nice. I will try them tonight with a glass of vegan wine haha. I am very happy that you’ll be in Vancouver this spring. Awesome! These are delicious! My kids love them, even the teenager who doesn’t usually like chickpeas. He ate half of of the most recent batch himself (as we have now made them several times. We put the batter into a silicone muffin pan for easy-peasy portioning. Thanks for sharing this great recipe!